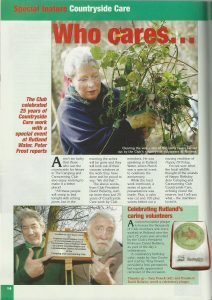 Central Counties Region have been involved with countryside care since 1979, when they took up the challenge to put something back into the countryside we use for our pastime. The prime mover in this challenge was the then Regional Chairman Mr John Lloyd who persuaded his friend and Regional colleague Mick Wicks to become the first Regional Countryside Care Officer. This Region is very proud and pleased that our Regional Councillor Norman Hemsley is the National Countryside Care Officer for the Camping and Caravanning Club. We know that the time and effort Norman puts into this appointment is making Countryside Care a great success.